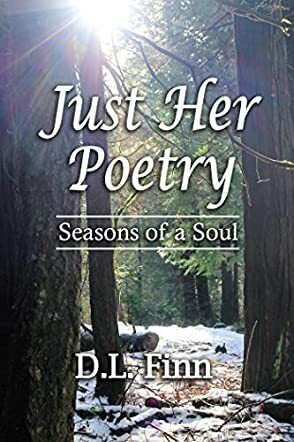 Just Her Poetry: Seasons of a Soul by D.L. Finn is a full-length book of poetry with high literary quality. It is divided into two halves, one about the healing beauty of nature and one about relationships and emotional situations. Part One—Just Her Poetry—talks about the seasons of the year in the spectacular scenery around the author’s home and contains a short set of vignettes called “Musings from the Back of a Harley,” detailing the thrill of motorcycle rides around the countryside. Part Two—Seasons of a Soul—explores emotions like sadness, hope, and insecurity in the face of destruction from human behavior and natural forces. There is also an area of poetry inspired by or excerpted from D.L. Finn’s other books and some poems about the holiday season. I really enjoyed Just Her Poetry: Seasons of a Soul. Rich in content and daily reality, the poems built on each other within each section to take up where the other poem left off. Much like writing chapters in a book of prose, D.L. Finn’s poetry is sophisticated storytelling. It grew in little images gradually to tell a complex story—a novel in verse. My favorite section was “Musings from the Back of a Harley,” a completely unique, distinct set of lyrics in which sharp edges of words brought the excitement of riding a motorcycle into verbal motion. Thought-provoking depth about the fragility of life appeared in other areas of the book, as in a series of poems (“Fire,” “We Wait,” “Wait,” and “Red Flag”) where fine writing brings the experience of living near forest fires into visceral, vivid clarity. Including some poems that connected into Finn’s other writings added more layers and was excellent for putting this book in context. Just Her Poetry: Seasons of a Soul by D.L. Finn is a collection of poems inspired by nature. In this book, D.L. Finn brings out the connection between man and nature and how the two are deeply connected. The book is divided into several broad sections such as Nature: Spring and Summer, Nature: Fall and Winter, Emotions: Darkness and Light, From the Book World, Family, Holidays and Vacations, and just overall musings in general. Each of these sections then contains several poems that pertain to the topic and usually revolve around the various hues and emotions evoked by the natural world and seasons, and the connection of the human mind and emotions with them. As D.L. Finn herself writes in her short bio at the end of the book, these poems were written everywhere depending on where and when the inspiration came from, including while riding on the back of a Harley motorcycle. I enjoyed reading Just Her Poetry: Seasons of a Soul and found that the poetry in general has a calming and serene effect. While I did like reading all of the poems in the book, the ones in the Nature and seasons section were some of my favorites. While reading them, I could literally imagine being transported to that particular season and time and place, and feel the snow coming down or the wind blowing in the autumn season. The writing style is quite poetic and heartfelt and I think nature lovers in particular will enjoy and relate to this collection. Overall, this is a great poetry collection for fans of the genre. Just Her Poetry: Seasons of a Soul is an uplifting collection, full of beautifully written poetry by D.L. Finn. If you love reading about nature, then the poetry in this book will enlighten you about the four seasons, starting with spring, and finishing with winter. The four seasons are unique in many different ways. The poetry in this collection will enlighten those who read it, and make the reader eager to delve into this amazing and beautifully written collection. The well written poetry about the ever changing seasons will impact the reader so much that once they finish reading, they will be ready for more that this author writes. Just Her Poetry: Seasons of a Soul is an inspired collection by D.L. Finn. I enjoyed reading this book, with its many well-written pieces of poetry which are very touching and inspiring. I like how the author uses the different activities of each of the seasons to entice the reader to dig deeper into the book until the end. The author writes each of the poems uniquely in their own way, expounding on the different highlights to enthrall the reader, and encouraging them to keep reading. With each poem there is a moral to learn from it, and the well-executed unfolding of each of the poems makes them invigorating and pleasant to read.